The banner of the king of Scots depicts a lion rampant, red on a gold background. In heraldic terms, that lion represents bravery, valor, strength and royalty. 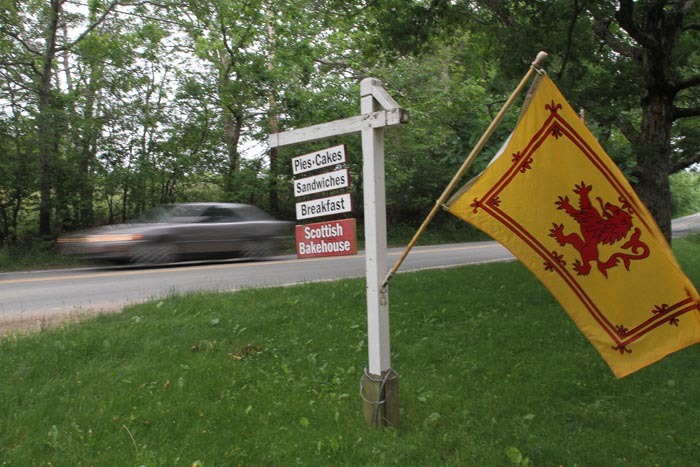 But as it has fluttered on a pole outside the Scottish Bakehouse on State Road in Vineyard Haven over the past week or so, it has represented something else: frustration with town bureaucracy. The edict came from Tisbury building and zoning inspector Kenneth Barwick, who told Ms. Dominick it is against town bylaws for a business to fly a big flag saying “Open.” It is permissible, however, to fly an equally large national flag. The distinction, the bylaw, and Mr. Barwick’s enforcement of it, all seem silly to Ms. Dominick, who believes her trade is being damaged by officiousness. “Apparently, the flag exceeds my allowable square footage for advertising,” she explained. It is not, she points out, as though the flag is obtrusive, or a hazard to anyone, which is the reason the town has rules governing signs. It impedes no sidewalk, because there is no sidewalk at the bakehouse, which sits by the rural roadside in an area of town where Vineyard Haven quickly melts into West Tisbury. Indeed, there is no other business for a mile or more in either direction. “It’s all a bit annoying. It’s ridiculous,” she said. Ridiculous to her maybe, but Mr. Barwick is serious about the issue of commercial signs. Two weeks ago, he flagged (pardon the expression) the issue with the board of selectmen. It is slated for discussion at tonight’s meeting of the board. The main concern is sandwich boards, those self-supporting, folding signs which some stores put up on sidewalks outside their premises. Some are appearing around the business district, even though the town has historically not allowed them. The reasoning behind that is pretty clear, said selectman Jeff Kristal: They impede the flow of pedestrians on narrow sidewalks. They can be a hazard if the wind kicks up. There could be liability issues if, for example, a kid got a finger caught in one. A quick drive around downtown Vineyard Haven yesterday recorded just one prominently-placed sandwich board, and it was out there by the guardians of pubic safety. It sits out in front of the town fire station, warning people never to park there. “I know Ken has always told people to put the sign on the building, and there’s not a problem,” said Mr. Kristal. Exactly why flags were a concern was a mystery to him, however. Mr. Barwick was on leave this week, and unavailable for comment about why he wants the selectmen to review the relevant bylaw. But in previewing the matter two weeks ago, he said he would address the distinction between advertising flags and national flags. Whether the selectmen will support him is to be determined. “Personally I have no problem with flags, but no doubt we’ll learn more about it on Tuesday,” said Mr. Kristal. I am totally amazed that the town has a problem with OPEN flags and sandwich boards. REALLY????? I always look for the open sign when I'm driving by and might, on a whim, want to stop in. But I have to admit that I like the Scottish Flag. I guess it won't help get tourists in, but I certainly enjoy it. They certainly need some sort of flag. No one would ever see them unless they were really looking and they are just too good to miss. Sandwich boards not allowed? These have been in town for 20-30 years at least, which I how long I have occosionally made and sold these items to VH businesses. Now that I don't make many signs any more, (and don't have to worry about sign committee or building inspector vendettas destroying my livlihood), I've got to say that most Island sign codes are poorly written, illogical and inconsistent. They are typically written by people who know little about signs, and permits are overseen by committees who know less. I have had island sign committees tell me they didn't like the name of a business, and that the name should be changed. A sign committee once told me "We don't like the color red..." I hear that a certain town now has decided it doesn't like glossy paint. (Around here, any paint loses its gloss in a year or two.) There is not a sign code on the Island that deals with scale...A large sign on a large building set back from the road, versus a small sign on a small building that's right on the road, or in town. This inability to address the scale issue ensures that signs are placed on the roads, or as close as possible to traffic, creating visual clutter everywhere. An example of this is the new Edgartown Hardware sign, which from the road is barely readable. An illegible sign is no service to its business, or to its community and the customers trying to find that business. I have never been a fan of large signs on this island, but if a driver has to slow down and squint to read a sign, it can create traffic backups or even an accident. 'Nuff said. This place is getting ridiculous.......a homeowner in the same residential district can fly any kind of flag they want, with any 4 letter words they choose.....but a business can't say "Open" ? Maybe Ms. Dominick can create a fun advertising campaign around the Scottish Flag - put her ads in the Gazette using the flag as a symbol of being open! The lion is reaching out as if to grab customers...just saying, it might be amusing to take a bad situation and play it to the good.